University of California Press, 9780520270343, 288pp. The primal experience of gathering is inscribed in every human’s DNA, and this book invites us to look beyond the refrigerator and cupboard to the abundance of wild edible plants that can be found and harvested everywhere. Part reference guide, part cookbook, A Feast of Weeds encourages readers to forage diverse natural environments for food, even in our city parks and streets. 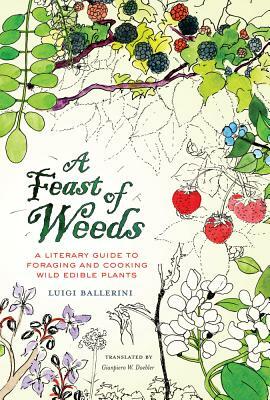 Luigi Ballerini shows tremendous breadth and depth of knowledge in an opening literary and historical analysis that explains how we have come to eat and cultivate wild plants. Each chapter that follows is devoted to a single ingredient—greens such as nettles, fennel, mint, chicory, and dandelion; and fruits such as berries, pomegranate, and prickly pear. Ballerini’s delightful commentary helps foragers recognize, gather, and cook their harvest. Delicious and straightforward recipes from Southern Italy bring out the flavor and wholesomeness of each ingredient, highlighting the peasant roots of each dish. Luigi Ballerini is Professor of Italian at the University of California, Los Angeles. Among his many books are The Art of Cooking: The First Modern Cookery Book, published by UC Press.